For a more thorough recruitment process, many employers conduct pre-employment testing. 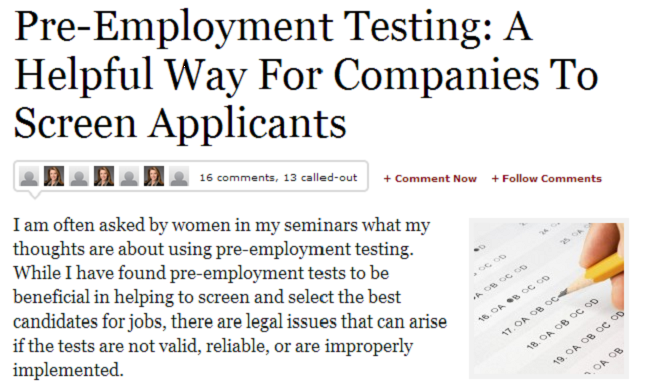 Lisa Quast writes in Forbes.com that these pre-employment tests can help organizations determine the candidates with the most potential to perform well in a given position. However, there are critical things to consider with these pre-employment tests. "The first issue is validity; 1) whether or not the test measures the specific criterion it is supposed to measure and 2) can it predict future job performance or success. An employer should be able to demonstrate that those who do well on the test do well in performing the job and those who score poorly on the test perform poorly on the job." These pre-employment tests are definitely helpful to companies hiring a new staff since they can't simply hire “Newbies” on the basis of an impressive resume or witty, intelligent answers during job interviews. However, a good score on these tests should not be the sole basis for hiring candidates either. Something that can help employers come to a good decision is employment background screening, which will allow the employers to dig deeper into a job candidate's past records. Real work in the field validates the information conveyed, plus proving Identity is necessary too. Background checks can include a variety of tasks to verify information and credentials, along with criminal history research, all in line with the Fair Credit Reporting Act. A bad credit score, however, does not necessarily lessen an individual's chances of getting hired, but a credit profile also helps to substantiate the conveyed information from the candidate or job applicant. However, in industries that deal with finances, like mortgage companies, insurance firms and banks, for example, a poor credit rating can be a negative factor for a job candidate, since it relates precisely to the job. After all, how can one provide sound financial advice to those who need it when he/she does not have a good record of managing his/her own finances? This factor may seem obvious, but that is the point. Looking into a candidate's criminal record history is also an important aspect of background screening. However, laws regulating criminal record checks vary from state to state, and any violation of these laws, whether knowingly or unknowingly, can make an employer legally liable too. To ensure that the appropriate protocols are followed when conducting background checks, it is best to rely on a reputable employment screening service for help, so that overall compliance and hiring risks get mitigated properly. With business environment today, employers can't risk hiring just any job candidate who shows promise, without validation. If businesses want to hire the ideal employees and avoid liability, they need to conduct a comprehensive background screening of all candidates and third party vendors. To ensure the screening process is compliant with local and state laws, employers can depend on efficient background screening services like The Accu-Facts Company, operating since 1986.